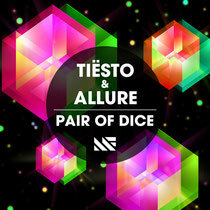 On October 8, Musical Freedom will release Tiësto & Allure's brand new single ‘Pair Of Dice’. This collaboration between one of the world's biggest DJs and his young protégé is currently a mainstay in sets of some of the most influential club DJs around the world and the teaser video has received over 150,00 YouTube views in its first weekend alone. Tiësto, along with a team of collaborators, have been involved with the Allure project since its very first release in 1998. In 2011, Allure released an artist album entitled ‘Kiss From The Past’ featuring collaborations from familiar former Allure vocalists like Christian Burns, JES and Emma Hewitt. While ‘Kiss From The Past’ was a new chapter in Allure’s history, it also marked a big change in direction as Tiësto announced he was stepping aside and allowing a new artist to emerge as the face of the project. ‘Roll The Dice’ is a proper introduction to the new Allure, with its big synths at center stage and emotive melody. Check it out below.